Over time, your hair follicles can become damaged due to age, over-styling, blow drying or environmental causes. This can lead to breakage, hair loss and an overall thinning of your hair. Follicles can also get clogged by oil and product buildup, which can harm them as well. According to “More,” you can restore your damaged follicles and help your hair grow in longer and stronger by using products targeted specifically to care for your hair and scalp. Use nourishing hair treatments and massage your scalp daily, and you will be on your way to healthier follicles. Begin taking biotin and niacin supplements daily. “Elle” states that these vitamins help give strength and health back to damaged hair and follicles. Ask your doctor before you add any new supplements to your diet, and talk to him or her about the dosage that is right for you. Wet your hair and give your scalp and follicles a massage with a hair and scalp salt scrub. According to dermatologist Francesca Fusco, M.D., this will restore damaged follicles and help maintain their health thereafter by keeping the blood flowing actively through your scalp. Use your fingertips to gently massage the scrub into your hair for a few minutes, and then rinse it out. Wash your hair and scalp with a fortifying shampoo. “More” recommends choosing a product that contains botanicals and essential oils, as these will work to clean your hair and scalp and encourage even more circulation. Wet your hair and hands, and place a small amount of shampoo in your palms. Massage it into your scalp and through your strands using your fingers, adding more product if necessary. Wash it all when you finish to prevent any product buildup or residue. Gently squeeze the extra water out of your locks, and then coat them with a moisturizing conditioner. “Cosmopolitan” suggests looking for a product that contains hydrating ingredients like shea butter or avocado oil, which will keep your hair and follicles nourished and help prevent breakage. 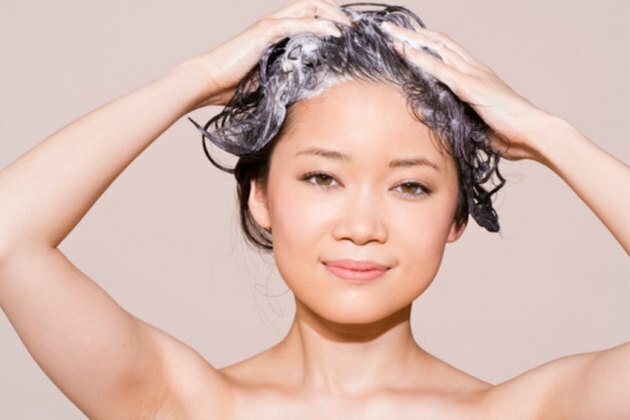 Smooth the conditioner through your hair, and allow it to stay on for five minutes before rinsing thoroughly. Let your hair air dry, or blow dry it using a low heat setting. “Cosmopolitan” notes that too much heat styling can weaken your hair and follicles and may lead to breakage. Apply a heat-protecting spray to wet hair first, and hold the blow dryer at least 6 inches away from your head.